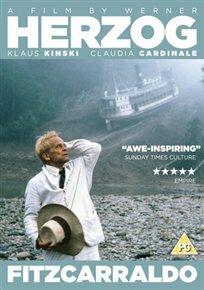 Brian Sweeney Fitzgerald (Klaus Kinski) is an opera-loving entrepreneur who dreams of building an opera house in the middle of the Peruvian jungle. To finance his project he attempts to persuade the rubber business to extend into the jungle, and concocts a plan which involves moving his steamship over a mountain to a parallel waterway. In making his film of the visionary’s adventures, director Werner Herzog famously refused to use special effects and insisted instead on actually transporting a steamship over the mountains.